Aly Cook Aly & Excalibur at World of Wearable Art & Collectable Cars in Nelson, New Zealand. Aly is a woman with a petite frame and a big voice. She is one of New Zealand's best kept musical secrets. Her songs are inspirational and uplifting. Her style is a blend of country, pop, rock but with an obvious 'Pacific' influence. Aly's debut solo release, the self penned "I Wonder", produced by NZ premier producer Alan Jansson, stayed in the NZ Top 40 airplay chart for several weeks. 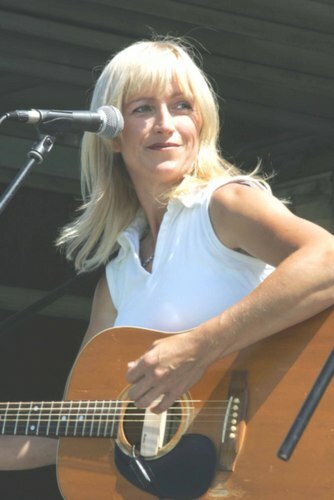 Gaining nomination for 2005 APRA NZ Country Song of the Year, Aly's 2000/2001 releases with her dance/house group "DNE" charted and was nominated for 2001 Coke Juice TV Dance Video of the Year as well as playlisting onto MTVDance in Europe. Aly's ability to write and sing in such an ecletic manner, has landed her music in everything from NZ TV Sitcoms like "Love Bites" and in "Shortland Street" to a variety of commercial work. Her sights are now aimed toward writing and performing music for film. Photo by Patrick Hamilton courtesy of the Nelson Mail. September 2006 marks the release to radio of Aly's newest single "Country Storm" Written in collaboration over the internet with David Erik from Cincinatti. "Country Storm" is an anthem of self-empowerment for women. The track is produced by RIAA Gold Record credited writer/producer Chip Martin in his studio in Nashville. The song shows Aly's power, range and pure emotional expression and energy. The "Country Storm" music video was shot in various locations including Hollywood & Nashville, tells the story of Aly's journey. It was produced by 2005 NZ Kodak Video Knack Award winner Paul Sparkes. The introduction above has been quoted from Aly's own excellent web site, and gives you just a taste of this talented and versatile New Zealand singer. Find out all the details about Aly, including a great gallery of photos by visiting her web site www.alycook.com/. Also check out her myspace site www.myspace.com/ALYCOOKMUSIC where there is more information and video to see.